Freight broker and produce distributor C.H. Robinson Worldwide turned in better-than-expected financial results in the fourth quarter of 2018, posting strong gains in revenue and higher profits across nearly all of its business lines, easing concern from some investors about a deceleration in freight shipments in the year ahead. The Eden Prairie, Minn.-based company posted net income of $187.2 million, or $1.34 a share, in the three months ended Dec. 31, compared with net income of $152.6 million, or $1.08 a share, in the same period a year ago. Top-line revenue increased 4.5% to $4.14 billion in the fourth quarter of 2018 from $3.96 billion in 2017. Net revenue grew 13% to $713.8 million from $631.7 million. The results pleased Christian Weatherbee, a transportation equity analyst at Citigroup Global Markets in New York, who noted that quarterly earnings per share came in well above the consensus estimate of $1.21 a share. Net revenue growth also exceeded expectations and contributed to a 100 basis point — equivalent to a full percentage point — increase in the company’s operating profit margin. “Solid beat,” Weatherbee proclaimed in a note for investment clients, adding that C.H. Robinson’s earnings report was a “good setup” for the year ahead. 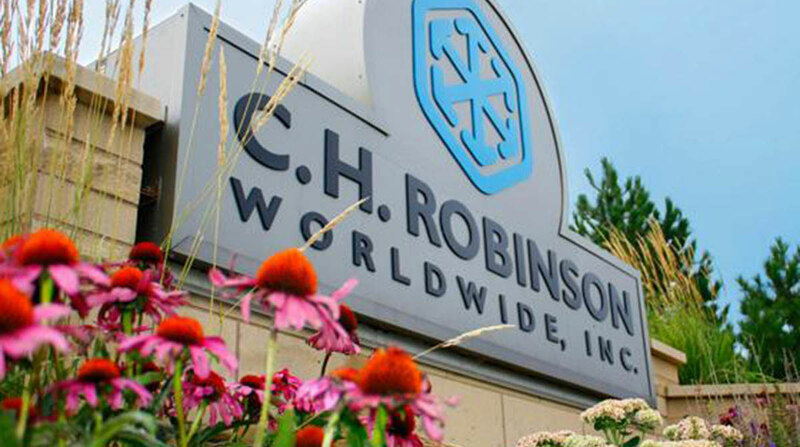 “Net revenue growth coupled with continued operating margin improvement should improve Robinson’s earnings outlook for 2019, particularly relative to the truckload sector,” Weatherbee said. Breaking down results by division, the North American Surface Transportation business generated operating income of $211 million in the fourth quarter of 2018, a gain of 16.9% from $180.6 million in the same period in 2018. Net revenue increased 13.5% to $471.4 million from $415.3 million and gross revenue rose 6% to $2.77 billion from $2.62 billion. The gains in revenue and profit came despite lower truckload and intermodal shipment volumes, as the company benefited from higher rates and lower purchased transportation cost, the company reported. Global forwarding generated operating income of $29.8 million in the fourth quarter of 2018, an increase of 76.9% from $16.8 million in 2017. Net revenue increased 11.6% to $142.7 million from $127.9 million and gross revenue rose 14.5% to $677.1 million from $591.2 million. Customs revenue also increased 12.4% in the quarter, driven by higher volume and pricing. Robinson Fresh, a division that supplies fresh produce to restaurants and grocery stores, generated operating income of $19.8 million in the fourth quarter of 2018, a gain of 53.5% from $12.9 million in 2017. Net revenue was $64.3 million versus $54.1 million and gross revenue was $531.8 million versus $594.6 million. Case volumes declined 6.5% due to lower traffic at restaurants served by Robinson Fresh’s food-service customers, company officials said. For the full year, C.H. Robinson posted net income of $664.5 million, or $4.73 a share, in 2018, compared with net income of $504.9 million, or $3.57 a share, in 2017. Net revenue increased 14.2% to $2.71 billion from $2.37 billion and gross revenue rose 11.8% to $16.63 billion from $14.87 billion. Looking ahead, Wiehoff said the company will remain focused on top-line growth and operating margin expansion. C.H. Robinson ranks No. 4 on Transport Topics’ Top 50 list of the largest logistics companies in North America and No. 1 on the TT list of top freight brokerage firms. The company also ranks No. 15 on the TT list of top ocean freight forwarders and No. 27 on the TT list of top airfreight forwarders.